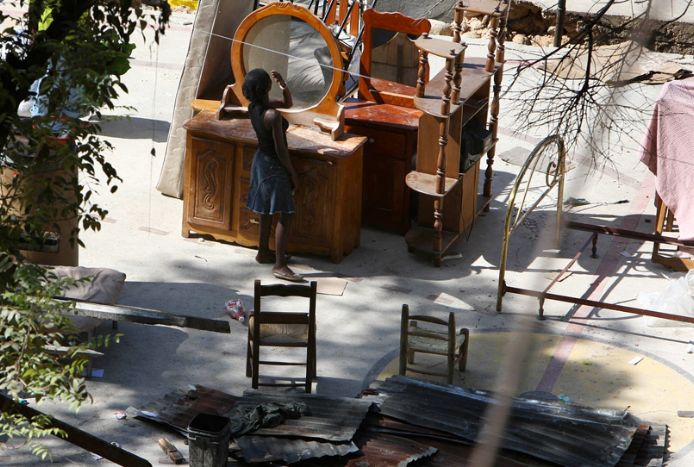 This week the New York Times ran a story entitled Haiti Emerges From Its Shock, and Tears Roll. The government had declared a national period of mourning, and the point of the story was that Haitians finally were able to grieve openly and collectively about their devastating losses. An accompanying slide show featured funerals and memorial services, while the story itself included eloquent testimonials that could have been included in any eulogy. Whatever the good intentions behind the reportage, I can’t help but think that this and similar stories are themselves ritual events: specifically, memorial services provided precisely so that the American audience can psychologically declare an end to the disaster and move on. The massive mobilization of charitable giving is slowing down, and the surge of compassion is being replaced by the daunting complexity of managing the long effort of reconstruction, and, well, it’s been more than a month and the Winter Olympics are on. Like any story, it seems that catastrophes ought to have a beginning, a middle, and an end. Likewise, the dramatic rupture of the beginning culminates in the symbolic repair provided by ritual performance at the end. And so it is that the shock of the initial trauma is soothed by the tears of emotional release during the time to mourn. These are important features of human life, and the press would be remiss in ignoring them. That said, there is another story to be told that has nothing to do with dramatic gestures. This is a photograph from the middle period of the disaster–a time when people already were beginning to get on with their lives. Furniture from a ruined house has been put out in the street. A woman is walking by, then stops and checks her reflection in the mirror. You can see that she is adjusting something–her hair or an eyebrow, perhaps. The scene is surprisingly intimate, and our gaze is not intrusive as she clearly would be aware that she is in a public setting. Come to think of it, people often steal a moment of privacy to check their appearance in store windows or other public mirrors, much as she is doing here. One might be tempted to fault her. “How vain! What a princess. Doesn’t she know her country has been wrecked?” I don’t see it that way. Instead, I see an act of triumph over adversity. A small act, to be sure–we are at the lowest level of the micro-political here–but an assertion that life as she knew it will go on somehow and she has a future in which it matters how she looks. In short, amidst near complete disruption of the normal state of things (where one’s bedroom now is in the street), there remain practical opportunities to do what you would want to do anyway. 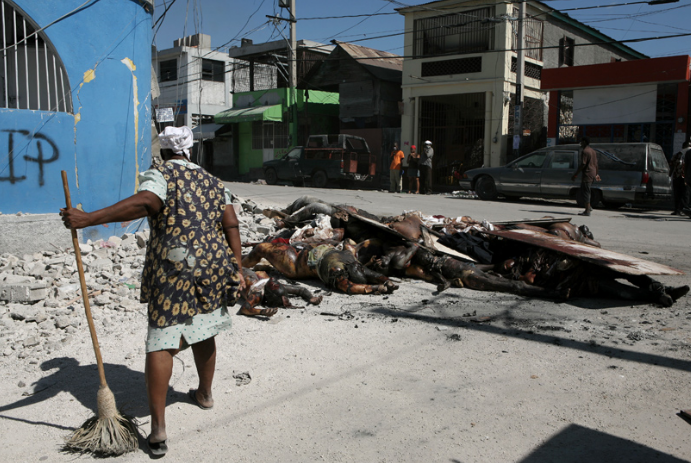 A woman is sweeping up the debris in the street in front of a pile of decomposing bodies. From her smock and broom, I’d say she’s swept up before. And why not now? She can’t move the bodies by herself, but she can sweep, and that has to be done if the place is to get back to normal. And don’t tell her that the scale of destruction is too great or that recovery will take many years or that there’s nothing she can do. As in the first photo, we see a lone individual engaging in what is usually a private activity, but now in a public space or a space having unusual public significance. In each case, I think we are seeing a civic practice, albeit in a peculiar sense. These are not the practices of state action or global mobilization by state and non-governmental organizations; instead, they are the simple habits of vernacular life. Habits that have transformative power precisely because they aspire to no more than continuity. Photographs by Ruth Fremson and Damon Winter for the New York Times. So true, so true. After all, the Winter Olympics are on! their …….. oops! There’s nothing to withdraw, they never blinked an eye! Thank you for your insight. It reminds me of visiting a refugee camp and how the women took such care of themselves – bathing, washing clothes, self-care, etc. No matter how devastating life can be, there is a certain kind of momentum that must continue. We must believe in the beauty of ourselves in order to believe that beauty can exist in the world. What makes these photographs amazing, as you suggest, is the micropolitical possibilities of recuperating resilience in the space of chaos. What these pictures highlight, in their micropolitical (and therefore ephemeral) possibility, is the potential for an “ethical universalism” (Appiah): these women are neither simply “earthquake victims” nor “vain princesses,” but rather photographic subjects on the unsure ground that exists between the two categories: much like us, their vulnerability is marked by their desire to be resilient; alternatively, their resilience is marked by their acknowledgment (that is, by relying on *this* mirror, in *this* space) of their vulnerability. What makes a tentative universalist compassion possible, then, is not that we identify her as a human (although, surely, we do); rather, that she and her mirror image make us realize the ephemeral (and therefore micropolitical) practices that assure us of our own stability – even as unstable as those may always be. I think these photographic examples of human reality are particularly symbolic of the nature of human survival. For us, the interpretation of the symbolic references that they represent becomes an individual experience and interpretation. I find them refreshingly real. I believe that we seek the familiar when we are faced with catastrophic events in our lives and society. In the aftermath of either a devastating fire, a tornado, a hurricane, a flood or other natural disaster the media is wont to show us how those affected move on with their lives by rebuilding their homes and cities in the physical realm, but they don’t show us how those involved survive through the use of enacting these methods of restoring personal normalcy to lives that have been disrupted by tragedy.